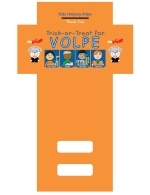 This Hallowe’en, Uncle Joe Volpe wants you to trick-or-treat for his Liberal leadership. If you don’t have a trust-fund to give to Joe, you can go door-to-door collecting money dressed up as mummy, a witch, or a newly minted, yet deceased, member of the Liberal Party of Canada! 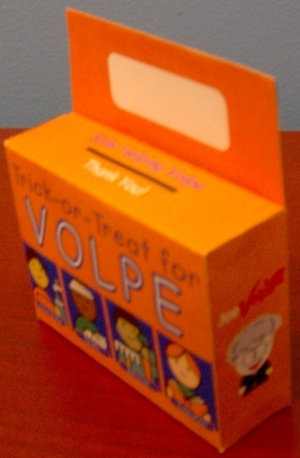 Make your own fundraising box! 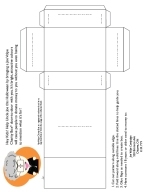 A special thanks to the frog-lady blog for the South Park likeness of Uncle Joe that was used as one small (but amusing) design element to create these boxes! Has the Canadian news media gone to the dogs? BONUS: Researching this article, I found perhaps the most bizarre, incoherent hodgepodge of anti-Conservative blather to date on puppy-gate and it comes courtesy of Toronto Star’s “Slinger”. Tie Domi, puppy-gate, a Peter MacKay assault fantasy, nazis, sexism and a critique on imagined Conservative (and Canadian) prejudice against Islam all at once? Who knew that the symptoms of Conservative Derangement Syndrome had parallels with those of ADHD? I just received an email from the Liberal Party of Canada offering me free media credentials to the Liberal convention in late November / early December. I hear that my pal Staples is the other Blogging Tory that’s been offered the gig. I suppose that means I have to start paying attention to the leadership race. That Volpe’s still got a shot, no? UPDATE: I’m lucky to be going for free as a media hack, but my friend Cherniak needs some help with his delegate fee. I’d ask that Liberals that read this blog to go and help him out if you can. James Lunney is a Conservative Party MP from Nanaimo-Alberni in British Columbia. Lunney is currently facing one of the silliest and petty legal challenges that I’ve ever seen. Nanaimo-Alberni MP James Lunney is being sued by a man who claims the chiropractor has misused the title of doctor for political gain. Nanaimo’s Robert Pound, in documents filed in B.C. Supreme Court in September, claims that Lunney’s use of the term doctor has been confusing to voters and others. In December, Pound initiated inquiries with the B.C. College of Chiropractors. 20 (1) A chiropractor registered under this Act, who holds the academic qualification of Doctor of Chiropractic granted by a college of chiropractic for a course of studies accepted by the board as qualification for registration under this Act, may display or make use of the title “doctor” or the abbreviation “Dr.”, but only as “Doctor of Chiropractic”, “Dr. of Chiropractic”, “Chiropractic Doctor” or “Chiropractic Dr.”. (2) Despite subsection (1), a chiropractor must not use the title “doctor” or the abbreviation “Dr.” in such a way as to suggest an occupation relating to the treatment of human ailments, other than as permitted under this Act. (3) On application from a chiropractor registered on or before January 1, 1984 to practise in British Columbia, the board may grant to that chiropractor the right to use the title “doctor” or the abbreviation “Dr.” as set out in subsection (1), if the board is satisfied that the academic qualification of the chiropractor is the equivalent of the academic program leading to the degree of Doctor of Chiropractic as granted in Canada. Paragraph 2 tells us that he is permitted to do so as long as he doesn’t mislead people to believe that he’s a doctor doctor (ie. an MD). Paragraph 3 describes a time-based exception. The first paragraph is clear… Lunney appears to be misrepresenting himself when he calls himself “Dr. James Lunney”. BUT, of course he is only misrepresenting himself in such a way if he is practising under the jurisdiction of the B.C. Chiropractors Act. Here’s my point: Dr. David Suzuki would also be in violation of the BC Chiropractors Act (in many ways, but with respect to section 20 for this argument) if he practised as a chiropractor and simply used the “Dr.” title. However, since David Suzuki doesn’t practise as a chiropractor, he is certainly permitted to use the “Dr.” bestowed upon him after earning his doctoral degree. Similarly James Lunney has a doctoral degree in chiropractic medicine (one assumes) and thus he is able to identify himself this way (“Dr.”) so long as he doesn’t do this while practising chiropractic medicine under BC law. Like Dr. Suzuki, Dr. Phil (PhD), Dr. Stephen Colbert (D.F.A.) and anyone else with a non-MD doctoral degree, he is allowed to self-identify himself as “Dr.” because he earned that degree. He would only be in violation of the act if he self-identified in this way to patients while in practice of chiropractic medicine. Even though the Halton MP is Garth non grata among his Conservative Party caucus colleagues, Garth is still a card-carrying member of the party and self-identifies as a conservative. Therefore, garth.ca is a welcome blog in our grassroots blogging organization (he was never even removed from our aggregator or blogroll). Half the members on the blogroll probably aren’t card-carrying of the Conservative Party but we all are conservative and support a conservative party or the conservative movement. And, in essence, that’s what Blogging Tories is and always will be, a community of small c conservatives. If Blogging Tories had existed during the Alliance/PC days, we would have aggregated blogs from both members of both parties since they were two conservative parties. Garth deserves a lot of credit for advancing online political communications in this country, a hobby that I share and love. Let’s be clear, Garth wasn’t ejected from caucus because of his blog, it was what he said on his blog. In truth, it was like being fired from a job for cause. Garth’s discourse is, however, well within the boundries of thoughful debate and while he was a bit too much of a loose cannon for the Conservative Party MP caucus, he’s certainly entitled to his opinion here so long as he’s a conservative independent or member of a small c conservative party. With all of that said, I do respect and admire the innovations that you have made with respect to online political communications in Canada, however, I do believe that your fighting for constituents could have been done with better agility than your confrontational approach. As a conservative, I believe that you have much to still contribute to both the conservative movement and the Conservative party. Let’s hope that your battle with the Conservative caucus can be like any good fight between two guys; after the punches are thrown, beers and laughs can be had when the terms of mutual friendship are understood. So, to Garth, you’re welcome here in the Blogging Tories caucus so long as you stick with your conservative principles as an independent MP or as a member of any conservative party caucus. We ought to be discussing income splitting and conservative approaches to the environment. However, if your blog becomes a soapbox at the expense of the conservative movement as it is propelled by a conservative party that advocates for conservatives issues (ie. if your anti-Harper sentiment comes at the expense of advancing conservatism), you’re out of the Blogging Tories caucus too! But, as you are now, you’re a welcome member of Blogging Tories and we are enriched by your advancement of conservative issues. Everyone seems to be hopping mad about Minister Ambrose’s Clean Air Act that was released in the foyer outside the House yesterday. I’ve done some reading and found a 2005 CD Howe report titled “Burning Our Money to Warm the Planet“. For 15 years Canadian governments have layered one greenhouse gas (GHG) policy over another — the 1990 Green Plan, the 1995 National Action Program on Climate Change, Action Plan 2000 on Climate Change, the 2002 Climate Change Plan for Canada and Project Green in 2005. The names changed, but the policy approach did not: it consisted primarily of offering information and subsidies to encourage voluntary reductions in emissions. Without substantial restrictions or charges for emitting GHGs, Canadian emissions have grown by 25 percent since 1990, outstripping the emission targets and commitments set by the government. As a result of investments in energy supply, infrastructure, buildings and energy-using devices, we continue on the GHG-intensive path, and the cost of diverting from it in future keeps rising. This is to be expected in a market economy where there are many benefits to businesses and individuals from burning fossil fuels, and these actions overwhelm the effect of voluntary efforts to reduce GHGs. This explains why the evidence from international experience with energy efficiency and climate policy suggests that emission charges or regulations are necessary if the GHG intensity of the economy is to be reduced over the next several decades. In spite of the mounting evidence that Canadas policies were not working, the governments last major policy initiative, Project Green, represented an intensification of the information and subsidy approach. A forecast based on a continuation of this approach suggests that Canadian emissions would increase by 50 percent within 35 years. Even the anticipated regulation of industrial emissions in its present form would be swamped by growth in key sectors, such as oil sands production and fossil-fuel-based electricity generation. If this policy approach continues, we will spend at least $80 billion over the next 35 years — but without reducing GHG emissions. Many Canadians believe we have been taking action on climate change when we have actually been doing little. In fact, it could be argued that without a substantial shift in policy, we will be burning our money to warm the planet. Five GHG plans over the past 15 years?! 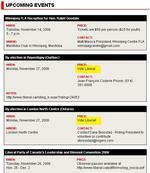 I suppose that Minister Ambrose’s makes the sixth. Fact: Canada’s GHG levels up by 25% since 1990. Forecast: Canada’s GHG levels up 50% by 2040 (based on the plans prior to Ambrose’s plan), and Canada $80 Billion out of pocket. Last night on CTV News, David Akin reported that the chief complaints were that GHG cuts wouldn’t happen until 2020, and that the lowering of GHG levels by 45-65% by 2050 is too far away. 2050 being 44 years away seems to be the main point of ridicule of the Conservative Green Plan. Let’s review, since 1990, GHGs have gone up 25% and resetting our reference point to the year 2005, they were projected to go up by 50% by 2040 by CD Howe. 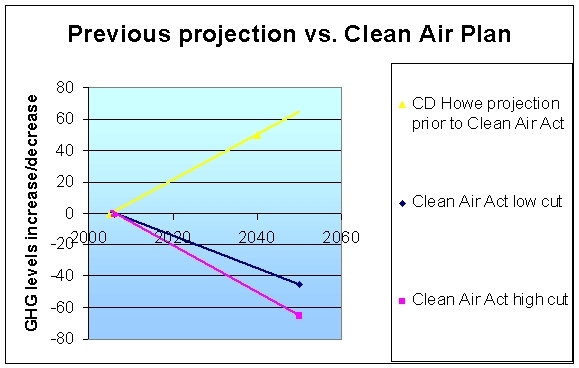 The Yellow line represent CD Howe’s projection of how we’d proceed under the previous GHG plans. The blue line represents the 45% low end goal under the Clean Air Act and the purple line represents the 65% high end goal under the Ambrose’s legislation. Of course, it would be useful to ask CD Howe to make new projections (if it could) under the legislation. Although, it should be said that their projections were made from observation of the real situation instead of legislative goals which may or may not be met. Let’s add some more data to the graph and integrate Stephane Dion and Bob Rae’s plan for cutting GHG emissions. Commit to coming as close as possible to Canada’s Kyoto objectives for 2012, and establish firm targets for subsequent periods, including matching European Union targets of 15-30% below current levels by 2020. Commit Canada to the long term target recommeded by the National Rountable on the Environment of a 60% reduction in emissions by 2050. The common knowledge is that if we were to meet Kyoto targets in the very near future, it would be from buying Hot Air credits from other nations. It would cost us money and Canada wouldn’t be helping. One key criticism of the Conservative plan is that it doesn’t set intermediate targets. This is valid criticism. 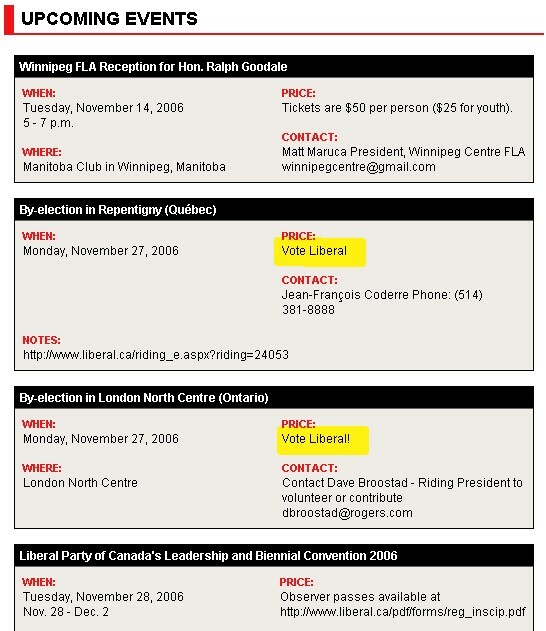 The long term goal of Bob Rae, however, is pretty much the same as that of Rona Ambrose. An extensive study by the National Roundtable on the Environment and the Economy has concluded that Canada should set an emissions reduction target of 60% below 1990 levels by the year 2050. This target is consistent with the international scientific consensus that a global 50% reduction will be required by 2050. I would adopt the 2050 target as proposed by the National Roundtable on the Environment and the Economy. Dion proposes a 50% reduction in GHGs by 2050. Let’s put Rae and Dion’s long term goals on the graph. I hope this provides more context for the debate. Note: GHG levels in 2020 are unknown relative to today. Projections are based on data available in 2005/2006 and 2050. Simplified graphs assume a linear relationship (actual results over the next 50 years will vary). 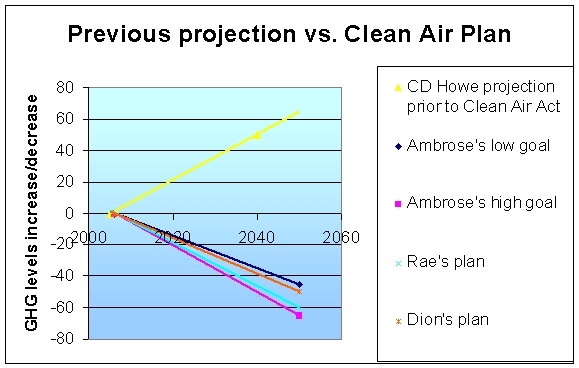 Graphs are only provided as a rough illustration to show the difference between plans and CD Howe’s projection under previous plans. The Tories released their Clean Air Act yesterday. Like 99.9% of Canadians, I haven’t read through the details yet but it seems that the media is particularly hostile to it, along with environmental groups. Luckily, they’ll use the old standby for criticizing Canadian conservative policy: George W Bush, of course! George W Bush is unpopular in Canada because of the Iraq war and has low approval numbers in the US too. Like virtually all Canadians, I haven’t read the Clean Air Act, but thankfully the media, NGOs and Jack Layton will use Canadian dislike for George Bush to bring us up to speed on how we’re supposed to feel about the proposed Conservative legislation on clean air. The government strategy also misses the point that in today’s world, the battle against global warming is an iconic cause on par with the war on international terrorism. To witness the passionate crusade led by former American vice-president Al Gore for more action on climate change. The Conservatives’ plan is similar to one announced three years ago by U.S. President George W. Bush, who called for an 18 per cent reduction in emission intensity by 2012. For example, at the first hint that Ontario carmakers might be forced to further restrict tailpipe admissions last week, Premier Dalton McGuinty — an alleged green champion — was warning Ambrose to back off. (Geoff) NORQUAY: There’s that George Bush again. LAVIGNE: I got it in there. “No targets means no accountability, … This announcement is nothing more than a recipe for delay. Adopting the Bush administrations standards will not lower emissions from vehicles.” — John Bennett of the Sierra Club. That George Bush ought to resign if for no other reason than to stop being used as a strawman for the Canadian media, Jack Layton and Elizabeth May. But seriously, using Bush this way comes at the expense of much needed debate in the MSM on the legislation. And now, I’m off to read the Clean Air Act. Garth Turner was booted from the Ontario Tory Caucus today, and by extension, he’s been suspended from the Conservative National Caucus. I’d always wondered how Garth found the appropriate balance between blogging and caucus confidentiality. I suppose he never did and its been cited as the reason why he’s been kicked from Tory ranks (suspended at this point). Stephen Harper’s office explains that this was an Ontario Caucus decision and that he was just as surprised as everyone else (well… as surprised as one could be about Turner the Maverick being suspended). In my opinion, its bad news for the Conservatives (losing an MP in a minority government always is), it’s news that the Conservatives don’t need and it was self-inflicted… at least as far as it was their decision. However, some might say that Turner made the decision himself by choosing to breach caucus confidentiality as far as he did. 1) Garth will fold and comply with his colleagues and stop being like a reporter in caucus. 2) Garth will sit as an independent MP. 3) Garth may become the first sitting Green MP. Knowing Garth’s personality, #2 is most likely, and #3 is speculation. UPDATE: Question Period is particularly spirited today with Liberals in high spirits and the Prime Minister fighting back hard rallying his party. The gallery is fuller than usual. UPDATE: Garth to be on CFRA at 5pm. Government to give big update at 5pm on Mike Duffy Live. I have said here many times, and consistently since I was elected this last time, that I work for the voters – the people, the taxpayers. After that I heed my party and the political establishment. All are important, of course, but the people come first. So, constituents first, party second. Fine. But one has to measure violating party trust in the context of infoming constituents. Were Garth’s alleged violations of caucus confidentiality required for bringing his consituents up to speed on critical issues, or was it more about gossip? UPDATE: At his 5pm press conference, Turner says that he was booted from caucus for what he believes were policy differences not because of a breach of caucus confidentiality.